We had a wonderful Thanksgiving meal with amazing friends and fantastic cheer. 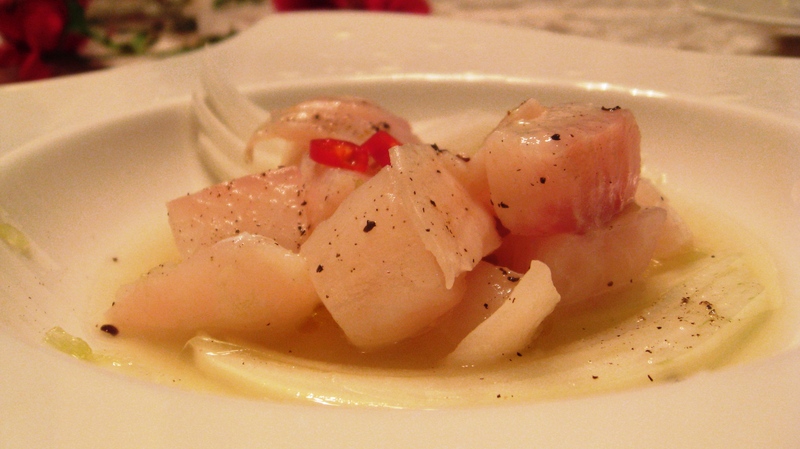 As promised, we are sharing our creations…in this case our friend’s creation, his famous Ceviche made with Tilapia. This was one of the most unusual starter dishes for a Thanksgiving feast, but one of the best I have had. This plate of love is so incredibly well balanced, the acid is perfect, the sheer simplicity of this dish, IS what makes it so fabulous. This recipe feeds 6 as a starter plate. Slice the onion and plate, then on a separate cutting board and with a different knife, cut fish filets into 1/2 inch strips and then into small bite size pieces. Cut fish the long way, against the grain. Sprinkle both sides of fish with plenty of sea salt. Place fish onto onion and squeeze about 2 limes of each one – depending on the size and juiciness of each lime. The fish should be soaked. Crack some fresh pepper on top of each dish and add the chili pepper. Finally drizzle olive oil on each dish. Let it sit for 3 – 4 minutes and then squeeze some fresh lime right before serving. Serve with some gluten-free beer or some chilled white wine if you like to indulge in some tasty libations. Note: Make sure that you freeze the fish the night before and unfreeze about 2 hours before serving. The idea is that the fish is served cold. Enjoy – please let us know what you think. From your friends at Nutty Kitchen.